On Tuesday the U.S. Supreme Court took up a case that could end up exploding on the terrain of American democracy with a force every bit as devastating as the bomb the court dropped with its infamous 2010 ruling in Citizens United v. FEC. The Democracy Campaign and 34 other citizen groups gathered on the steps of the State Capitol to sound alarms about McCutcheon v. FEC and what it could do to our political system. We weren't alone. Coalitions like ours did the same all across the country. Citizens United cleared the way for unlimited election spending by special interest groups. That decision hit like a ton of bricks. Here in Wisconsin, election spending tripled after the ruling. McCutcheon could do for mega-donors to candidates and parties what Citizens United did for interest groups sponsoring their own election advertising. 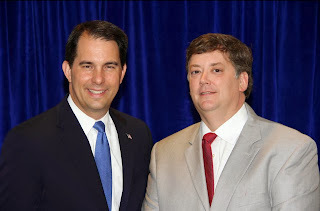 Wealthy businessman Shaun McCutcheon (pictured with Wisconsin Governor Scott Walker at an Alabama fundraiser) wants a key federal limit on political contributions to go away. McCutcheon's case zeroes in on a single number: $123,200. That's the federal aggregate limit on what an individual can give to candidates, parties and political action committees in a given election cycle. A grand total of 1,219 people – four out of every million Americans – reached that limit in the 2012 elections. But one out of every six American billionaires maxed out. For them, the federal limit is cramping their style. If the Supreme Court sides with Shaun McCutcheon, political power will be even more concentrated in the hands of a very wealthy few. How few? If the court grants McCutcheon his wish, 0.000003% of Americans will have even more ability to influence our elections and will have even more political power than they already possess.